I work now as a Research Associate for the Arab Image Foundation in Beirut on a strategic program called the Middle East Photograph Preservation Initiative (MEPPI). MEPPI is led jointly with the Metropolitan Museum of Art in New York, the University of Delaware, the Getty Conservation Institute and the Qatar Museums Authority. – The MEPPI Survey, a survey aimed at identifying and assessing significant photograph holdings in the Arab world. Our scope also extends to collections in Turkey, Iran and Afghanistan. – The MEPPI Courses, a series of courses, where collection keepers will be invited to learn and share best practices about photograph preservation. – The MEPPI Symposium, where regional cultural policy decision-makers will be invited to reflect upon the importance of photographic heritage. In field work, I believe. I am conducting the research on collections in the Arab Peninsula region. I go through the significant collections in the region. I’ve found photo archives and collections in administrations, museums, archaeologists, Oil companies, photographers studios, Newspapers… I was in Qatar, in Bahrain, as I am writing I am in Dubai, Emirates, I’ll visit in the coming weeks Abu Dhabi, Kuwait, Saudi Arabia, Oman. How an exciting challenge! I’ve already made a lot of stimulating encounters and met people passionately involved in preserving and promoting photographs . If I have not contacted you and you want to get in touch with me, just let me know through this site or sending me a message at leturcq[at]meppi[dot]org. 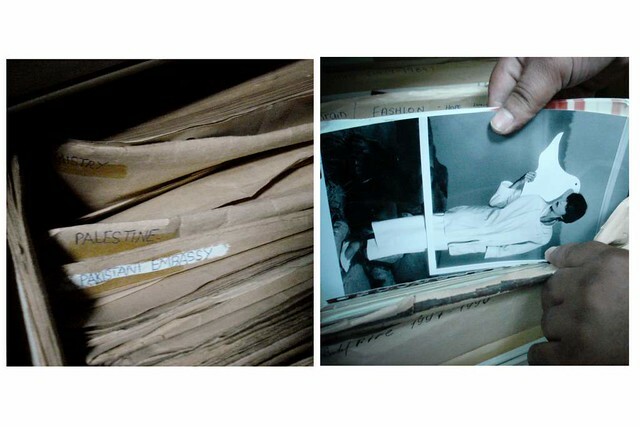 Surveying photograhs collections, Bahrain, Sept 2011. undisclosed location.